What would you like to hear from me at BlogHer? At every annual BlogHer conference I’ve given one (or several) talks and workshops. I’ve always gotten a lot of great feedback from my workshop sessions on coding and debugging, blog security and privacy, and other technical how-tos, as well as talking about politics, women’s history, feminism and identity, and how our writing online ties into the letters and diaries and activism from women in the past. Last year I spoke about what it’s like to be a small blogger who suddenly is on the crest of the wave of breaking news and talking with mainstream media. I also try to approach tech support for our bloggers and community as part of my personal feminist activism: tech support as empowerment! Since I work for BlogHer full time, I’m on call as a speaker to fill in anywhere the organizers need me to, so I could end up anywhere. Still, I like to propose my own panels! I’m considering “A Server of Her Own” or “Feminist Hackers” . . . If you’re thinking of coming to BlogHer ’12 in NYC next , what would you like me to speak about or teach? Any particular subjects or panels you’ve seen me run before, that you’d like to see happen again? Or, if you’re thinking of coming to speak, what kind of panel or workshop would you like to run *with* me? Not that it’s all about me! 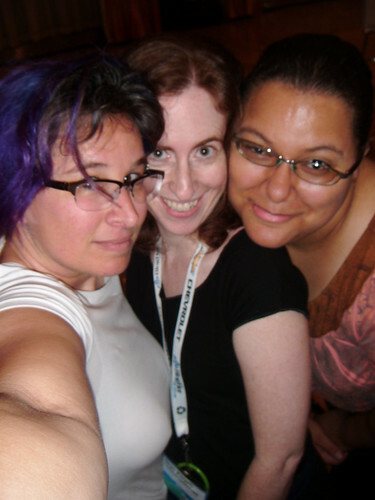 If you’re thinking about coming to BlogHer or putting in an idea or a talk proposal… read on! BlogHer is an extremely friendly and open conference. 80% of our speakers each year are new speakers at the conference! It started with 300 women in San Jose years ago, and now I think our numbers at the annual conference are closer to 4000. Yes! Four thousand blogging women! (And sundry.) The parties are great — the people are the best thing though. Some people are nerdy, some are more writerly, some personal, some blogging on particular subjects, some very commercially oriented and many not at all. As with all the best conferences the sessions are good but the hallway and lobby conversations that happen informally are even better. Read through Polly’s (very helpful) Call for Ideas, and Jes’s How to Become a Speaker at BlogHer! And if you have any questions for me personally about the conference, feel free to ask in comments or email me at liz@blogher.com. So thrilled you posted this, Liz! I hope your readers pile on with the ideas! LOL Polly, all 3 of my readers….. People did respond on G+ though!